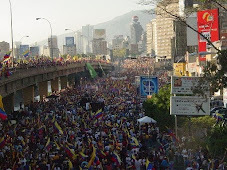 Venezuela News And Views: Fascism forges ahead in Venezuela: the army declares journalists "military objectives"
Fascism forges ahead in Venezuela: the army declares journalists "military objectives"
The regime is relentless in its desire to silence any critical voice. As Chavez numbers keep sliding down even though his populist measures give him a monetary hiccup in the trend lines, it is clear that the regime has a need to silence opposition. For example we are reminded today by Globovision main owner, in exile in the US, that the pressure is sustained against Globovision. The regime is trying to get control of it by getting financial control of Globovision so as not to suffer the negative press it got when it downright closed Radio Caracas. But the people around Chavez are also taking very dangerous initiatives. In an army publication an article appeared declaring certain journalists to be "military targets". That is right, there are some inside the armed forces that are drawing plans to get rid of anti Chavez journalists. I need not underline to you how grave such a thing is. The picture becomes clearer, Chavez definitely feels threatened. You have to wonder what other "dispositions" are out there. Not just journalists but other "influential" people too. "No, Because We Don't Call It Fascism." an example of what you had mentioned?